We start at O, where no votes have been cast. Each vote for A moves us one point east and each vote for B moves us one point north until we arrive at E, the final count, (m, n). If A is to lead throughout the contest, then our path must steer consistently east of the diagonal line OD, which represents a tie score. 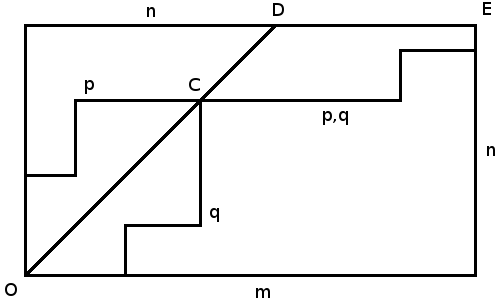 Any path that starts by going north, through (0,1), must cut OD on its way to E.
If any path does touch OD, let it be at C. The group of such paths can be paired off as p and q, reflections of each other in the line OD that meet at C and continue on a common track to E.
This means that the total number of paths that touch OD is twice the number of paths p that start their journey to E by going north. Now, the first segment of any path might be up to m units east or up to n units north, so the proportion of paths that start by going north is n/(m + n), and twice this number is 2n/(m + n). The complementary probability — the probability of a path not touching OD — is (m –n)/(m + n). Fun isn’t it? But now, I have to conclude my post, to work a little bit on my make-up : I have learnt so many thinks at the Montreal Zombie Walk a few days ago that kids willing to knock at my door will be scared to death. I guess I will keep all the candies for me this year !